Robert Torchia, “Robert Henri/Volendam Street Scene/1910,” American Paintings, 1900–1945, NGA Online Editions, https://purl.org/nga/collection/artobject/54132 (accessed April 19, 2019). 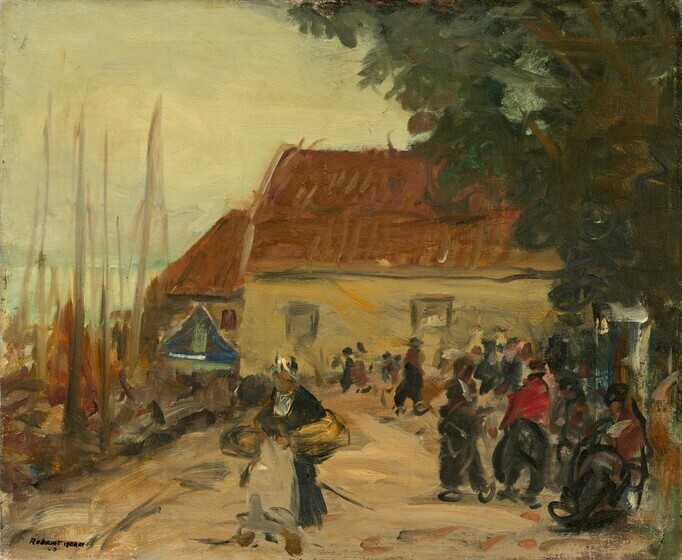 Volendam Street Scene, one of roughly 60 canvases Robert Henri painted during his third visit to Holland, documents rustic Dutch village life and colorful traditional costume. The rapidly executed sketch exemplifies the artist’s desire to capture momentary, spontaneous visual effects. A woman crosses the road in the center foreground, while a group of villagers go about their daily business on the right. Despite the abbreviated forms, their distinctive hats and clogs are recognizable. Henri visited Europe during the summer of 1910, where he spent the first six weeks in Haarlem, The Netherlands. During the late 19th and early 20th centuries Haarlem and the quaint villages around it on the North Sea were frequented by many European and American painters. Volendam is a fishing hamlet north of Amsterdam on the coast of the Zuider Zee that a contemporary British travel guide called “the manufactory of most of those Dutch pictorial scenes known the world over," and recommended its "quaint alleys, its magenta-clothed fishermen, its gaily dressed girls in striped shirts and winged caps." These artists included William Merritt Chase, Robert F. Blum, Gari Melchers, George Henry Boughton, George Hitchcock, and Henry Ward Ranger; see Hans Kraan, "The Vogue for Holland," in The Hague School: Dutch Masters of the 19th Century, ed. Ronald de Leeuw, John Sillevis, and Charles Dumas (London, 1983), 115–124. Henri had been to the area twice before on a brief visit in 1895 and in the summer of 1907, when he taught a class for the New York School of Art. Bennard B. Perlman, ed., Revolutions of Realism: The Letters of John Sloan and Robert Henri (Princeton, NJ, 1997), 197. Annette Stott, Holland Mania: The Unknown Dutch Period in American Art & Culture (New York, 1998), 50, has argued that the indistinctness of the forms in Volendam Street Scene gives it a “generic appearance” that diminishes its “Dutchness,” and thus reflects a modern style practiced by a later generation of American artists that “conflicted with the traditional subjects and values on which the town had built its reputation.” the same qualities that two decades earlier had led Paul Gauguin (French, 1848 - 1903) and his circle to Pont Aven, in Brittany, France. In Volendam Street Scene, a woman crosses the road in the center foreground, while a group of villagers go about their daily business on the right. Despite the abbreviated forms, their distinctive hats and clogs are recognizable. The painting is related to earlier pictures Henri had painted during his student years in France, such as the Brittany scene Quay at Concarneau (1899, Sheldon Memorial Art Gallery, University of Nebraska, Lincoln). George Hitchcock, "The Picturesque Quality of Holland," Scribner's Magazine (Aug. 1887), quoted by Lionel G. Robinson, "Mr. George Hitchcock and American Art," Art Journal 43 (Oct. 1891): 292. (Chapellier Galleries, New York), by 1969; Mr. [d. 1994] and Mrs. [d. 1991] Gerard C. Smith, Washington, D.C.; gift 1973 to NGA. American Art Selections, Chapellier Galleries, New York, 1969, no. 24, repro. Robert Henri: Painter-Teacher-Prophet, New York Cultural Center, 1969, no. 53, repro. Extended loan for use by Secretary Patricia Roberts Harris, U.S. Department of Housing and Urban Development, Washington, D.C., 1977-1979. Extended loan for use by Justice John Paul Stevens, The Supreme Court of the United States, Washington, D.C., 1981-1984. Robert Henri, Painter, Delaware Art Museum, Wilmington; Pennsylvania State University Museum of Art, University Park; Cincinnati Art Museum; Phoenix Art Museum; Corcoran Gallery of Art, Washington, D.C., 1984-1985, no. 66, repro. Extended loan for use by Ambassador John Shad, U.S. Embassy residence, The Hague, The Netherlands, 1987-1989. Extended loan for use by Ambassador Howard Wilkins, U.S. Embassy residence, The Hague, The Netherlands, 1989-1992. Extended loan for use by Secretary Michael Espy, U.S. Department of Agriculture, Washington, D.C., 1993-1995. Extended loan for use by Ambassador Craig R. Stapleton, U.S. Embassy residence, Paris, France, 2005-2009. Dutch Utopia: American Artists in Holland, 1880-1914, Telfair Museum of Art, Savannah; Taft Museum of Art, Cincinnati; The Grand Rapids Art Museum; Singer Museum, Laren, The Netherlands, 2009-2011, no. 20, repro. The priming covers all of the tacking margins, indicating that the canvas was primed before painting. This treatment usually indicates that the priming was commercially prepared rather than applied by the artist. The artist first made a rudimentary sketch in dark paint, over which he applied colors with rapid and loose brushstrokes in low impasto. The X-radiograph has little density, indicating that there was very little white lead used in the paint mixtures. There are no discernible changes visible in the X-rays. No underdrawing was evident in infrared examination. Other than a small retouched area on the mast of the second boat on the left, the painting is in excellent condition. The surface is coated with a slightly discolored, natural resin varnish. American Paintings: An Illustrated Catalogue. National Gallery of Art, Washington, 1980: 174, repro. Williams, William James. A Heritage of American Paintings from the National Gallery of Art. New York, 1981:199, repro, 202. Perlman, Bennard B. Robert Henri, Painter. Exh. cat. Delaware Art Museum, Wilmington, 1984: 110-111, no. 66, color repro. American Paintings: An Illustrated Catalogue. National Gallery of Art, Washington, 1992: 200, repro. Perlman, Bennard B., ed. Revolutionaries of Realism: The Letters of John Sloan and Robert Henri. Princeton, 1997: xi, 200 fig. 28. Stott, Annette. Holland Mania: The Unknown Dutch Period in American Art & Culture, New York, 1998: 50, repro. Stott, Annette. Dutch Utopia: American Artists in Holland, 1880-1914. Exh. cat. Telfair Museum of Art, Savannah; Taft Museum of Art, Cincinnati; Grand Rapids Art Museum; Singer Laren Museum, The Netherlands, 2009-2011. Savannah, 2009: no. 20, 120, repro. (catalogue also published in Dutch in 2010: Dutch utopia : Amerikaanse kunstenaars in Nederland 1880-1914). These artists included William Merritt Chase, Robert F. Blum, Gari Melchers, George Henry Boughton, George Hitchcock, and Henry Ward Ranger; see Hans Kraan, "The Vogue for Holland," in The Hague School: Dutch Masters of the 19th Century, ed. Ronald de Leeuw, John Sillevis, and Charles Dumas (London, 1983), 115–124. See Henry Harvard, The Dead Cities of the Zuyder Zee: A Voyage to the Picturesque Side of Holland, trans. Annie Wood (London, 1875), 39–43. Handbook to Holland, 8th ed. (London, n.d.), 125. Bennard B. Perlman, Robert Henri Painter (Wilmington, DE, 1984), 111. In this case, an extra set of tack holes exists, indicating that the painting was once removed from its stretcher. But it still seems that this stretcher is the original one. The priming covers all of the tacking margins, indicating that the canvas was primed before painting. This treatment usually indicates that the priming was commercially prepared rather than applied by the artist.